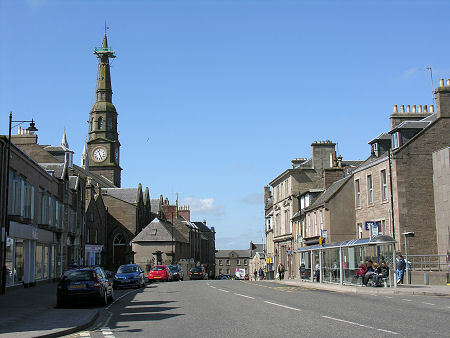 Forfar is the administrative centre of the unitary local authority area of Angus, and was previously the county town of the County of Angus: a county whose links with Forfar were reflected in the name it was known by until 1928, Forfarshire. 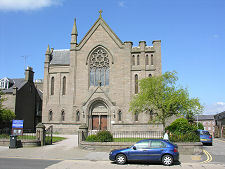 Forfar is located about 13 miles north of Dundee and 17 miles west of Montrose. It stands at the heart of Strathmore, the broad and fertile agricultural valley which cuts right across the middle of Angus and extends into Perthshire to the south west. 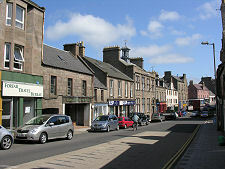 Traditionally the town stood as the focal point of a web of roads extending to all corners of Angus and beyond. In 1987 a bypass was built to the west taking the traffic using the main A90 from Dundee to Aberdeen out of the town. 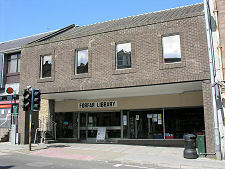 Forfar had very early origins, and there was probably a settlement here during the Pictish era when the area of Angus formed part of the Kingdom of Circinn. 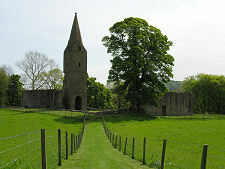 A mile and a half east of Forfar is Restenneth Priory, which was founded by King Nechtan of the Picts in the years after 715. By the early 800s there seems to have been a Pictish stronghold at Forfar, which was besieged by King Kenneth I or Kenneth Mac Alpin. Legend relates that Feredith, King of the Picts, tried to relieve the siege and was killed in the process. The Pictish stronghold seems to have been translated into an early Royal Castle used as a base by Malcolm II of Scotland in defeating an army of Danes in Angus in 1012. 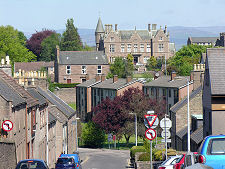 When Malcolm III became King of Scotland in March 1058 he called a parliament at Forfar Castle, presumably at this time a wooden palisaded structure which stood on the town's Castle Hill. 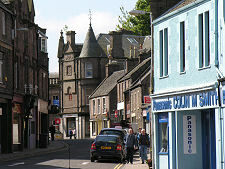 At about the same time Malcolm seems to have chartered the town as a Royal Burgh. During the reign of William I, probably in the 1170s, Forfar Castle was rebuilt. At about the same time the town was made the administrative centre of Angus, and in 1185 it was rechartered as a Royal Burgh. In 1297 the castle, by now probably built of stone, was surrendered to Edward I of England. It was recaptured for the Scots in 1298. It changed hands at last twice more during the wars of independence before being dismantled on the orders of Robert the Bruce. 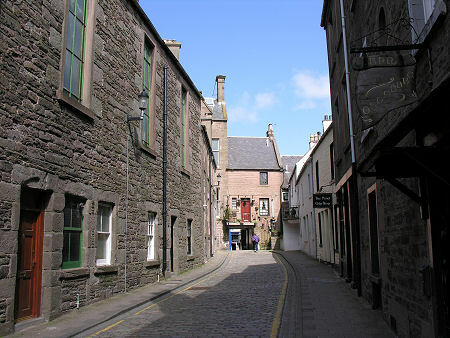 Forfar gradually grew in size during the middle ages and by the early 1600s it ranked among the top 25 Scottish towns in terms of tax yields. In 1651 Cromwellian troops under General George Monck effectively destroyed the town. 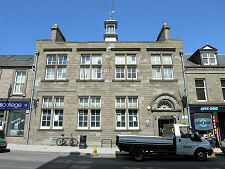 In 1665 the restored Charles II replaced Forfar's Burgh Charter, which had been lost during the sacking of the town in 1651. 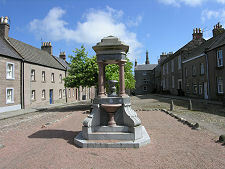 In the 1700s Forfar became an important centre for the manufacture of coarse osnaburg linen. By the end of the century there were 450 weavers in the town, most using locally grown flax. By the mid 1800s there were 5,000 hand loom workers trying to compete with the steam powered textile factories that increasingly came to dominate the town. 1800 saw the start of a business bottling spring water in the town and by the mid 1990s Strathmore Spring Water displace Perrier as the best selling bottled water in the UK. 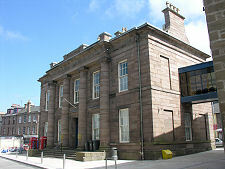 The railway arrived in Forfar in 1839, initially as a result of the building of a line with a gauge of 5'6'' to Arbroath. The price of coal fell dramatically, giving the steam powered textile factories a further boost, though another effect was said to be the demise of the local brewing industry as cheaper "imports" from Dundee became readily available. A standard gauge line was built from Perth via Stanley in 1849. Passenger services survived until 1967, but even the goods service freighting out locally grown potatoes had ceased by the early 1980s. 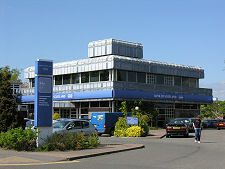 Agriculture and food production have always been an important part of Forfar's economy. Bottled water and potatoes have already been mentioned. 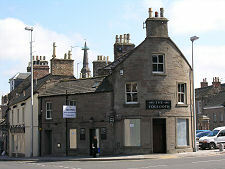 Forfar also gave its name to the popular Forfar Bridie, a type of meat pastie first made by Margaret Bridie of Glamis in the 1800s and sold at the Buttermarket in Forfar. 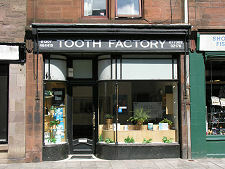 Today Forfar is home to Strathmore Foods, a company which among other things makes 200,000 scotch pies every week.